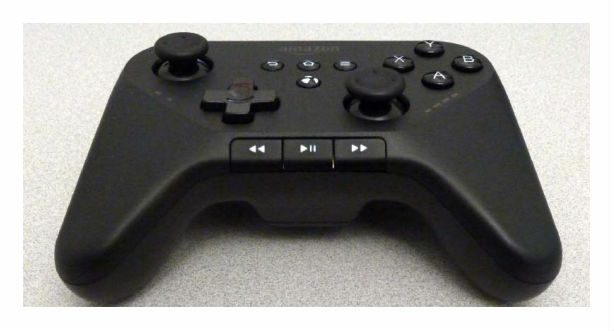 Amazon readies a wireless game controller, but for what? Amazon (S AMZN) has been busy registering a wireless game controller with regulators around the world, and a filing in Brazil (PDF download), spotted by Dave Zatz, got us some up-and-close pictures of the device. The controller features gamepad-typical controls, but also a button that looks like it’s related to Amazon’s GameCircle service. There are also Android-like home, back and menu buttons and media playback control buttons. Zatz mused that the controller could be connected to Amazon’s Roku competitor, which is supposed to launch any day now. That’s possible, especially since we do know that the company’s media streaming device will be based on a forked version of Android, or Amazon Common OS, as it is called internally. However, it’s also possible that Amazon could release a basic, budget-priced streaming device, as well as a more expensive version that features enhanced gaming capabilities. There have been numerous reports about an Amazon game console in the past. In January, a report claimed that Amazon had shown gaming hardware to video game publishers, and in February, Amazon bought the game developer Double Helix Games.